Unlike the UK with its Feed-In-Tariffs (FITs), there was no such incentive in 2010 in the Republic of Ireland - but determined to diversify and to continue to take its farm forward, the McDonnell family decided to go ahead with using both its dairy herds and poultry manure to produce biogas. The McDonnells had the vision - and had more than done their homework. They'd had planning permission since 2003, and having conducted site visits from as far afield as America and Australia (but primarily in Scandinavia and Germany), David McDonnell and his father Michael's extensive research resulted in an impressive bespoke plant - one created with realistic, sustainable expectations - that has become a landmark in renewable energy for the country. 'The nitrates directive was really beginning to kick-in during the late 2000s', said David McDonnell. 'These EU directives meant serious implications for farmers, so with our annual fertilizer costs up at around 100,000 Euros, we wanted to look at how we could produce our own, better, eco-friendly fertilizer, which at the same time for us was a natural progression for the farm. Thanks to our AD operation, our annual fertilizer costs have now been reduced to one third. In the future we can hopefully look at converting our digestate into a marketable product. We wanted to use the land as best we possibly could - and ensure that what came out of our AD plant could be put onto our land'. He continued: 'Although we worked closely with German engineering firm Kreig & Fischer on the design of our plant, we chose to work directly with our equipment suppliers. This was far more attractive to us'. 'Kirk supplied our first digester (1000m3), with Gary Little recommending Landia for its mixing systems, introducing us to the late Hugh Vaughan. Lifetime cost was a very big selling point for us - as was a relationship with companies who were proud of their work and prepared to roll up their sleeves and make things happen'. At first, Landia's GasMix didn't appear to be achieving the results that had been forecast, but this was soon rectified by a site visit from Hugh Vaughan who back-flushed the pipework to remove a blockage caused by a build-up of sulphur. Digestate was forced up the reverse way to clear the pipe - and after a short break for lunch, the digester was being mixed to full effect. Since then, as part of its preventative maintenance schedule, the back-flushing of pipework is now a regular part of GreenGas' rigorous maintenance program. David McDonnell added: 'GasMIx having all moving parts on the outside of the digester is a big plus. You don't have to take a hit on your gas yield. A service agreement was put in place with Landia and an extended (two years) warranty, but because of the robustness and reliability of the pumps, the latter was never needed'. In addition to the GasMix system, GreenGas also invested in Landia's side-entry mixers for its digesters to add some extra impetus if and when required. Such is the efficiency of the mixing systems that GasMix (combining a Landia chopper pump and a series of venturi nozzles) only has to run for approximately 15 minutes every two and a half hours. The side-entry mixers run for only approximately 5 minutes every hour, so energy usage is extremely low. 'Even though our dry solids are usually a maximum of 5%, we feel that the side-entry mixers give us a guarantee', he said. ï¿½We scrutinise our feedstock, but it changes. Typically, cattle slurry will be richer in the winter with the cows indoors being fed on maize. Straw can be quite challenging to process. Food waste can vary tremendously, and weï¿½ve had all sorts of unexpected objects found in it ï¿½ shovels, car engine parts and even a stray bowling ball! That said, this is pretty much in the past now because we have developed Feedstock Acceptance Agreements with our suppliers, who have become trusted partners. We monitor every load. We need to protect our bugs. We have rejected lots of potential feedstock because continuity of supply is so important to usï¿½. Since 2010, GreenGas has developed from a quarter to a half, to its current status as a 1MWel plant, adding a new 1800m3 digester (from Wolf-Austrian) in 2015. As well as pumps, mixers and the GasMix system from Landia, GreenGas also uses a pasteurizer from the same company. It switched this two years ago from the front to the back end of the process because it made more sense to increase the temperature of digestate already at 40 degrees to the required ABP pasteurisation of 70 degrees - rather than wait for it to be heated up from an ambient storage temperature of only 6-10 degrees. Excess heat is used for the plant and for the poultry sheds on the farm nearby. 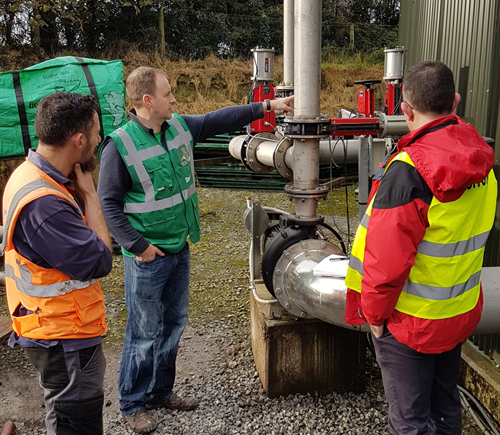 'The plant runs very well', continued Senan Meade, 'We always avoid shock-loading the digesters - and everything is enclosed, but we are very conscious about being good neighbours, so we use carbon filters and always keep all doors closed when unloading or mixing. Landia's advice was to rotate the use of the mixers and nozzles on the digesters to help make them last as long as possible. Regular daily checks are very worthwhile, just doing the basics with oil and grease when required. You can catch any problems very early. It's all about getting the balance right and fine-tuning so that you hit the sweet spot for a smooth-running plant. We have alarms in place and can keep a very close eye on things away from the plant on our smartphones. Even after all this time, we're still learning - constantly. David McDonnell concluded: 'We're beginning to approach our eighth year as an AD operator - and have to say that with 23 of its pumps and mixers on site, Landia's very robust and reliable equipment has certainly played its part in the growth, wellbeing and efficiency of this plant. We've come a long way because there was no real AD industry in this country when we started and certainly very few financial incentives - and we still have nowhere near the catalyst as Northern Ireland or as in many other EU member states. Our gradual investment in what now totals over half a million Euros in Landia's pumps and mixers speaks for itself, but the back-up, pride and enthusiasm to help us get the very best from our plant is priceless'.